Description - Premium Tiles w/ Traction Squares offer two distinctly different materials molded into one tile. Produced using a revolutionary process, these extremely rugged and low profile tiles are perfect for both wet and dry applications. 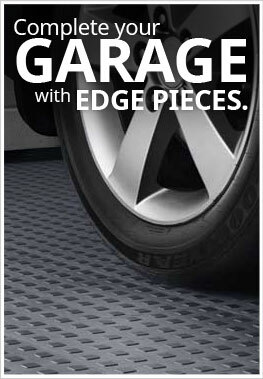 Featuring rubber traction squares and soft touch under pads, these tiles are quieter and more slip resistant than our standard hard plastic garage tiles. Easy to install and maintain, these interlocking tiles are backed by a lifetime warranty and are resistant to staining, oils, grease and most household chemicals. Material – Tiles are constructed of high quality impact resistant polypropylene (extremely durable hard thermoplastic polymer). Rubber Squares are made from natural rubber. Recommended Uses – Premium Tiles w/ Traction Squares have been built to be a truly multi-purpose floor. Commonly used as tile flooring for garages, these tiles have also been used in laundry rooms, basements, man caves, kitchens, commercial stores, tradeshows, show rooms, game rooms and much more. If buckling occurs, do not fear. Expansion joints are available to help alleviate that. These joints are added to allow the floor to properly expand and contract with heating and cooling of the day. You will want to install these in the middle of your floor for proper results. If you have further questions about how to install these joints, please feel free to contact our friendly Customer Service Department at 877-479-7420. Stain resistant and UV Stable. Soft touch underside for added stability and a silent step compared to others on the market. Slip resistant and odor free. Interlocks with all TechFloor Tiles. The floor came out amazing. It was easy to put down and so far I have no complaints. Everyone who sees it wants to do their floor as well. I created a cool design for my garage floor and it turned out great. I decided to go with these tiles because they had an expansion joint (unlike the others) so I didn't have to worry about leaving a gap around the edge of my floor. The tiles were easy to install. It took me and my son about 2 hours to install the whole design. Definitely recommend these tiles to anyone wanting a great looking garage. Tiles were as described in write up. They were easy to install and easy to cut. They have been down for two weeks and so far no problems. Read installation instructions before you start install and do some pre-planning and you should have no problems. Tiles were shipped on a pallet and arrived as scheduled. Will have to wait and see on durability and cleaning. My husband and I installed the tiles in our basement (very simple to install: align with interlock joints and use rubber hammer to connect/click them in). These are exactly as described online: flexible, sturdy with great traction both from the bottom and on the surface. They added a layer of temperature insulation as well, right now it feels much warmer in the basement (and because of it at the first floor as well) then otherwise. Will be buying more (once when we bounce back from our holiday shopping :D).